It is estimated that 33% of the world’s fisheries are overfished while 60% are fished to their maximum capacity. Illegal, unreported and unregulated (IUU) fishing is a leading cause of this state of overfishing in our ocean. Through international commitments such as Sustainable Development Goal 14, political momentum to address the health and sustainable use of our ocean has been building. However, tangible actions to address the long-lasting and even permanent damages from IUU fishing remain inadequate. The European Union is the largest seafood market in the world, importing more than 60% of its seafood. Due to its very nature, IUU fishing is invisible to regulations and policies in place to protect marine life from harmful fishing methods and from being overfished. This also means that IUU fishing is unaccounted for when governments evaluate the fishing industry’s impact on the ocean and when planning the allowable quantity of fish to be caught in future years. IUU fishing practices have dire consequences for multiple stakeholders in achieving a sustainable blue economy, including vulnerable coastal communities in less developed countries that rely on the ocean for their livelihoods, as well as for large and small-scale fishers that abide by the rules but lose out when there are no fish left. The biggest impact the EU can have to eliminate IUU fishing is to have a zero tolerance view on the import and sale of illegal seafood products in its market. The WWF EPO works to maximise the impact of the EU’s IUU Regulation, which aims to prevent, deter and eliminate IUU fishing. To date, the EU's IUU Regulation has instigated some key improvements in the global fight against illegal fishing, but significant gaps remain to successfully implement the requirements that block the import and sale of illegally-sourced seafood products in the European market. The EPO aims to ensure that EU Member States are applying effective controls on the seafood they import to guarantee their legality, thereby demanding fully traceable and transparent seafood supply chains. The EPO also holds the European Commission accountable to its position as an international leader to set the example for sustainable fishing practices worldwide. We provide evidence-based recommendations and strategic vision to help the EU achieve this position, and build relationships with external stakeholders to leverage the EU’s influence to improve international fisheries governance. The EPO’s work to combat IUU fishing is made possible thanks to the generous donations of Oceans5 and NORAD. 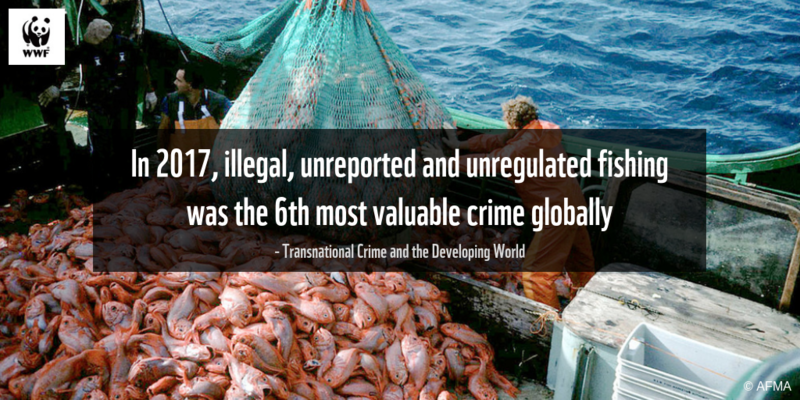 IUU fishing has an estimated annual value of USD $15.5- 36.4 billion. The European Union is the largest seafood market in the world, importing more than 60% of its seafood from other countries. IUU fishing represents an average 15-35% of total fisheries production volume, between 12 and 28 million tons of fish. In the hardest affected regions, the rate of IUU fishing is as high as 40% of the total catch and is performed by foreign vessels, so both the resources and the revenues leave the region. More than 500 million people in developing countries rely, directly or indirectly, on the fishing industry for Employment. The effects of IUU fishing in reducing fish stocks have serious negative impacts on the livelihoods of those employed by the legal fishing sector.